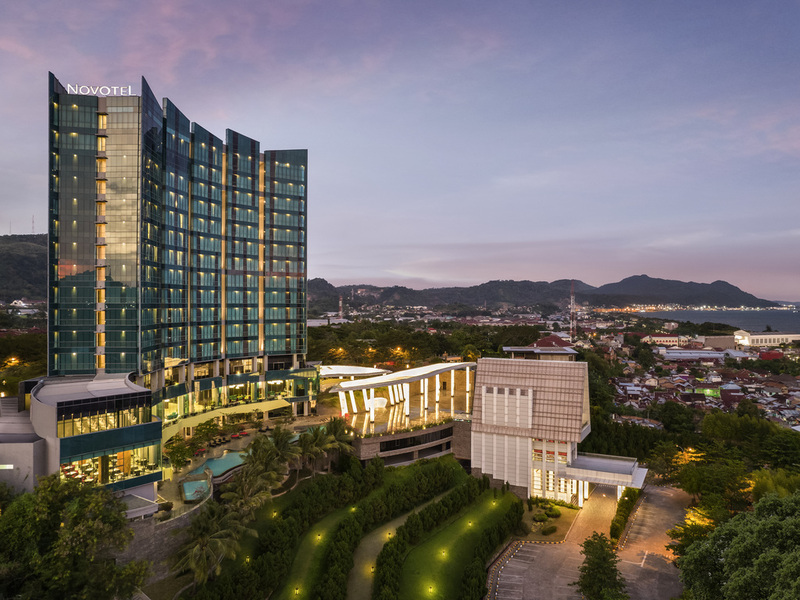 Novotel Lampung is a 4-star hotel which gives you an easy access to explore and reach the nearest interesting places in Bandar Lampung, such as Museum of Lampung, shopping center, many beautiful beaches (Sari Ringgung, Mutun, Ketapang). There are also Bumi Kedaton Garden, Butterfly Garden. You can also access more tourism destinations in Lampung Province. For example: Kiluan Bay, Tanjung Setia Beach, Bukit Barisan National Park, Way Kambas Elephant Conservation Center. Good services and good view. I usually stay in Novotel when I had a business trip. Excellent Services and Helpful. Nice view with delicious breakfast. The ocean view is great view, but i'm really confused with the curtain in the bathroom why it not closed all the glass. No email reply when asking for airport pick up. No welcome drink.Breakfast is poorer compared with before maybe because of under renovation. The gold leclub member is not got any welcome drink voucher. The point is late updated. Good service and nice place. Dear Mr Herry, Warmest Greeting from Novotel Lampung, Thank you for your comments posted in TrustYou highlighting the shortfalls you have encountered during your stay with us. We appreciate your constructive feedbacks, and we value them positively, as it enables us to monitor that we are providing the level of facilities and services that our guests deserve and expect. We would like to sincerely apologize for the inconveniences caused to you. We have taken notes of your comments and the respective Department Heads would do immediate follow up for improvements. At Novotel Lampung, it is our aim to always provide an exceptional experience for every customer; therefore your feedback is very important to us. We would very much like the opportunity to further discuss with you regarding your concerns in order to get a deeper insight into your overall experience of the hotel and redeem your faith. We would be most grateful if you would be so kind to contact us at gm… to share your feedback on this. Regards, Lalu Aswadi Jaya, General Manager. The staff are very helpful, we have a slight argument with the front office procedure, but hotel team handled it well with a prompt action. Overall, still the best hotel in town. Lobby AC is not working. Temperature is hot. When asked to reception, no honest answer is given. Sge just simply said it is normal. Not a good answer for a reputable hotel like Novotel. Cafe is under renovation for mote than 9 months and it is still not completed. The replacement place is not recommended as it is open and you can see flies flying to the food. Not healthy at all. Dear Mr Darwis, Warmest Greeting from Novotel Lampung, Thank you for your comments posted in TrustYou highlighting the shortfalls you have encountered during your stay with us. We appreciate your constructive feedbacks, and we value them positively, as it enables us to monitor that we are providing the level of facilities and services that our guests deserve and expect. We would like to sincerely apologize for the inconveniences caused to you. We have taken notes of your comments and the respective Department Heads would do immediate follow up for improvements. At Novotel Lampung, it is our aim to always provide an exceptional experience for every customer; therefore your feedback is very important to us. We would very much like the opportunity to further discuss with you regarding your concerns in order to get a deeper insight into your overall experience of the hotel and redeem your faith. We would be most grateful if you would be so kind to contact us at gm… to share your feedback on this. Regards, Lalu Aswadi Jaya, General Manager. When i was check in at novotel lampung, the services is excellence. Great! I feel so satisfied in staying at Novotel Lampung, the staffs are so welcome and friendly. I also enjoying myself spending my time at the pool. Moreover, I can see a beautiful sea view from my room. Thank you very much for the services, in my opinion, Novotel is a highly recommended hotel because of the service and the hotel facilities. Great service and facilities ! It's good to spend my nigt at novotel. BF and food were not good. International food was not international style. Dear Mrs Aree , Warmest Greeting from Novotel Lampung, Thank you for your comments posted in TrustYou highlighting the shortfalls you have encountered during your stay with us. We appreciate your constructive feedbacks, and we value them positively, as it enables us to monitor that we are providing the level of facilities and services that our guests deserve and expect. We would like to sincerely apologize for the inconveniences caused to you. We have taken notes of your comments and the respective Department Heads would do immediate follow up for improvements. At Novotel Lampung, it is our aim to always provide an exceptional experience for every customer; therefore your feedback is very important to us. We would very much like the opportunity to further discuss with you regarding your concerns in order to get a deeper insight into your overall experience of the hotel and redeem your faith. We would be most grateful if you would be so kind to contact us at gm… to share your feedback on this. Regards, Lalu Aswadi Jaya, General Manager. food is not delicious and expensive breakfast. only swimming pool is good. Dear Mr Kukuh, Warmest Greeting from Novotel Lampung, Thank you for your comments posted in TrustYou highlighting the shortfalls you have encountered during your stay with us. We appreciate your constructive feedbacks, and we value them positively, as it enables us to monitor that we are providing the level of facilities and services that our guests deserve and expect. We would like to sincerely apologize for the inconveniences caused to you. We have taken notes of your comments and the respective Department Heads would do immediate follow up for improvements. At Novotel Lampung, it is our aim to always provide an exceptional experience for every customer; therefore your feedback is very important to us. We would very much like the opportunity to further discuss with you regarding your concerns in order to get a deeper insight into your overall experience of the hotel and redeem your faith. We would be most grateful if you would be so kind to contact us at gm… to share your feedback on this. Regards, Lalu Aswadi Jaya, General Manager. Overall, nice to stay at novotel, the facility is good, clean and the view is nice. Keep it up. Dear Mr Hartono, Warmest Greeting from Novotel Lampung, Thank you for your comments posted in TrustYou highlighting the shortfalls you have encountered during your stay with us. We appreciate your constructive feedbacks, and we value them positively, as it enables us to monitor that we are providing the level of facilities and services that our guests deserve and expect. We would like to sincerely apologize for the inconveniences caused to you. We have taken notes of your comments and the respective Department Heads would do immediate follow up for improvements. At Novotel Lampung, it is our aim to always provide an exceptional experience for every customer; therefore your feedback is very important to us. We would very much like the opportunity to further discuss with you regarding your concerns in order to get a deeper insight into your overall experience of the hotel and redeem your faith. We would be most grateful if you would be so kind to contact us at gm… to share your feedback on this. Regards, Lalu Aswadi Jaya, General Manager.